(i) Full-time Programme: Minimum of three academic sessions. (ii) Special Programme: Minimum of two academic sessions. (ii) Sandwich Programme: Minimum of six contact sessions in June/July every year with study assignments between contact sessions. (i) Minimum of first degree or equivalents obtained from a recognized University/Higher Institution. (ii) The degree classification for entrance must be a minimum of Second Class Lower Division. (iii) The candidate must also satisfy basic entry requirement for the degree programme as stated above. (i) Minimum of two semesters of course work and maximum of three academic sessions required for graduation. 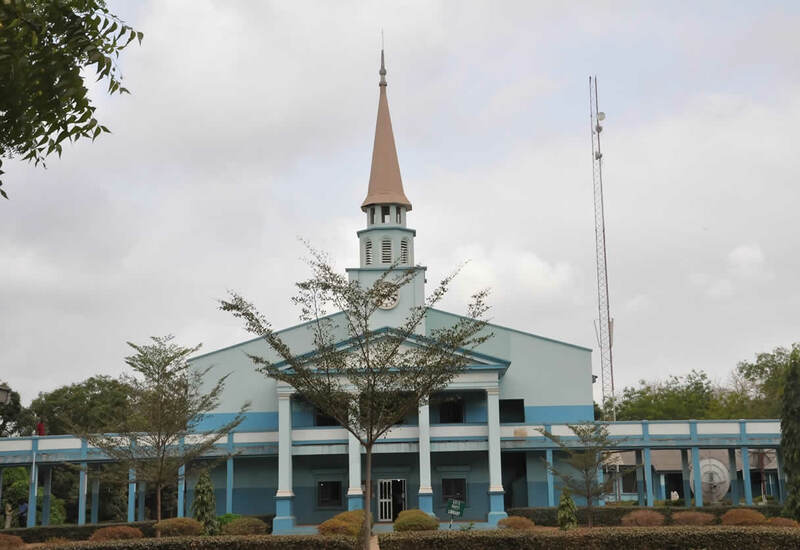 (ii) Those who already possess theological degrees but whose cumulative point average (CGPA) does not qualify them for admission into higher theological training and; those with master degrees and above in religious studies but lacking in theological flavour. (iii) A candidate must cover 40 units of course work plus 6 hours of thesis writing, making a total of 46 hours. Candidate must also make at least 3.0 commutative grade point average (CGPA) and must not earn below a C grade in each of the courses taken. For music ministers with BCM, or M.Div. C. M. or equivalents obtained from NBTS or other recognized theological institutions with a minimum of two-year successful full-time practical church-related experience after graduation. (i) The degree classification for entrance must be a minimum of Second Class Lower Division or a minimum of CSA of B. (ii) The candidate must also satisfy basic entry requirements for the degree programme (as stated above). (i) Those already possessing master degrees or above from recognized learning institutions but lacking in theological flavor, and those who had R.E degrees but whose cumulative point average (CGPA) does not qualified them for admission into higher theological training. (ii) Minimum of two semesters of course work and maximum of three academic sessions required for graduation. (iii) A candidate must cover 40 units of course work plus 6 hours of thesis writing, making a total of 46 hours. Candidate must also make at least 3.0 commutative grade point average (CGPA) and must not earn below a C grade in each of the course taken. For Pastors/Gospel Ministers with B.Th. or BRE, M. Div. or M. Div. 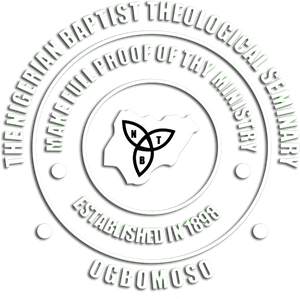 R. E. or equivalents obtained from NBTS or other recognized theological institutions with minimum of two years successful full-time practical church-related experience after graduation. (i) For now, the course is run at sandwich level for a minimum of four contact sessions in June and July each year with study assignments between contact sessions. (ii) The degree classification for entrance must be a minimum of Second Class Lower Division or minimum of CSA of B. (iii) The candidate must also satisfy basic entry requirements for the degree programme as stated above. (i) A calling and willingness to minister to and train leaders for youth ministry work in an evangelical church. (Including recommendation from the church pastor). (ii) A minimum of 3 years? experience working in a local church youth ministry as a leader or volunteer. (iii) A bachelor degree or equivalent as for other MA degrees in a theological institution. Master of Theology Degrees (M.Th. M.Th.R.E.,): Two year master?s degree programmes by research for candidates possessing B.Th. BRE,M. Div., M. Div. R. E. obtained from NBTS or any other recognized theological institutions plus a minimum of two- year successful full-time practical church-related experience after a post-secondary theological institutional training. i. The degree classification for entrance must be a minimum of Second Class Lower Division or minimum of CSA of B.
ii. The candidate must also satisfy basic entry requirements for the degree programme as stated above. Master of Church Music (M. C. M.): Two-year master’s degree programmes by research for candidates possessing BCM, M. Div. C. M. obtained from NBTS or any other recognized theological institution plus a minimum of two-year successful full-time practical church-related experience after a post-secondary theological institutional training. (i) The degree classification for entrance must be a minimum of Second Class Lower Division or minimum of CSA of B. (ii) The candidate must also satisfy basic entry requirements for the degree programme as stated above. (iii) Minimum of two semesters of course work and maximum of three academic sessions required for graduation. (iv) Those already possessing recognized professional degrees in Music not below the First degree. Master of Philosophy (M.Phil. ): Admission requirements for M.Phil. (i) minimum of B (55-59) to qualify for admission for M.Phil. Doctor of Ministry (D.Min. 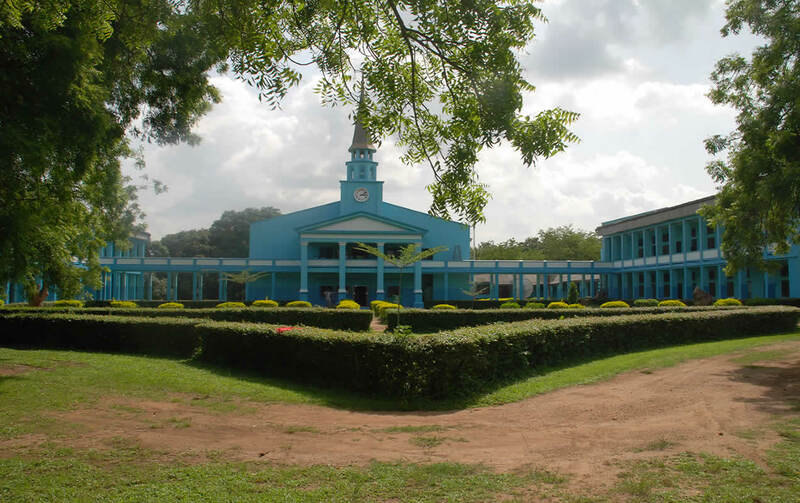 ): An advanced ministry oriented professional terminal degree programme designed to equip persons committed to Christian ministry (including pastors, Christian educators, church musicians, missionaries, denominational workers, or other ministry vocations) for a high level of excellence in the practice of ministry in their chosen area. (a) M.Th., M.Th.R.E., M.C.M, M.A.T.S or equivalents with a minimum CSA of B to spend a minimum of six contact sessions of three weeks each in January and June/July of each year (i.e. within 3 years). (b) M.Div., M.Div.R.E., M.Div.C.M. with a minimum CSA of B. (c) Prior to beginning Doctor of Ministry Seminars, an applicant holding the Master of Divinity degree is required to complete two full Master of Arts in Theological Studies contact sessions (to earn a minimum twenty-four semester hours of seminars at MATS level) with a minimum average of B. (d) All applicants for the Doctor of Ministry will be requested to write and submit with the official application form an autobiographical essay of at least 3000 words that addresses the applicant?s personal history (including religious history), concept of ministry, current ministry position, reasons for desiring to pursue the Doctor of Ministry degree, and expectations related to the programme of study. (f) An applicant must have a full-time ministry position and continue in it throughout the period of his or her doctoral studies. (g) All applicants must also satisfy the basic entry requirements for the degree programme as stated above. (a) M. C. M./M. A. C. M. or equivalent theological degree from NBTS or, in exceptional cases, equivalent degree qualification from recognized and accredited tertiary theological institution with a minimum CSA of B. (b) Must fulfill general entry requirements for the degree programmes as stated above. (c) A minimum of three academic sessions by design (two years of seminars in residency to complete the course work for the DMA degree). Total time spent in pursuing a DMA should by no means exceed seven academic sessions. (a) M. Th./M. Th. R. E. or equivalent theological degree from NBTS or in exceptional cases, equivalent degree qualifications from recognized and accredited tertiary theological institutions with minimum CSA of B. (c) A minimum of four academic sessions by design. (d) Seminar work: (Residency, 2 years); Tuition, accommodation and other fees for the 2 years. (g) Third Academic session: Proposal defence in October/November. Library and field work will continue to complete the project. (h) Fourth Academic session: Internal defence in November/December. External defence in February/March. Final corrections in April and May. In addition to general conditions/admission requirements, admission into all undergraduate and M.Div. programmes in music shall require audition/placement tests in area that would be agreed upon by the Faculty. In addition to basic requirements, admission into the M.C.M. and D.M.A programes requires successful performance (at least 60% or B+) in Music Entrance Examinations and Proficiency Examinations, as well as a solo audition recital. The Entrance Examinations are written in the areas of music theory, analysis, church music history, Christian worship and Christian hymnology. The comprehensive examinations for D.M.A shall include two (2) languages. Proficiency Examinations shall cover basic keyboard, basic voice, basic conducting, musicianship and the candidate’s minor solo instrument. The solo audition is a twenty (10/20) minute – memorized performance on the applicant’s major solo instrument. Those wishing to major in composition may submit a portfolio of original scores with an accompanying recording of at least ten/twenty (10/20) minutes in length. For all levels, minimesters shall be reserved for special instructions in theory and practical courses in candidate’s department/area of concentration. Such courses shall be duly examined and added to regular cumulative results. The Faculty will announce the available courses as it deems fit. Applications should be made after June 1 and before November 30 each year to be eligible for the next year’s intake in August. Application forms and related materials must reach the Registrar’s Office by November 30 (each year). Entrance examination takes place on the first Saturday of every February.